Good use of angles and obscuring smoke help make few men seem like a large mass. 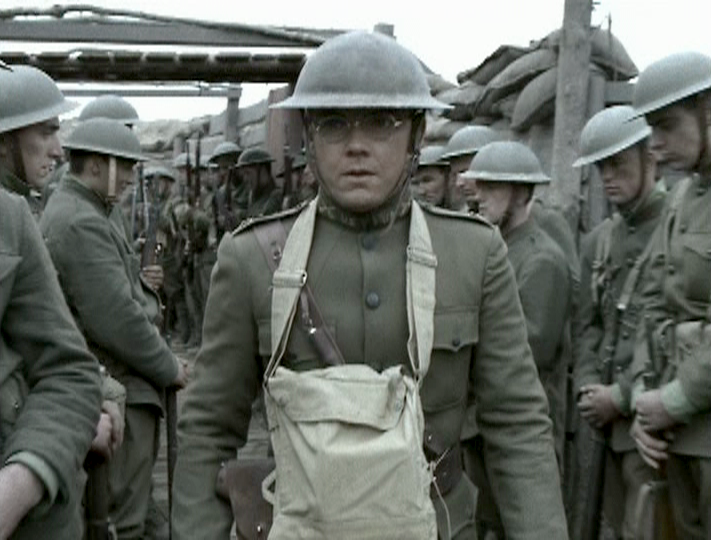 The Lost Battalion (2001), directed by Russell Mulcahy, was aired on telvision’s A&E network in 2001. It is a historical film based on real events. The story follows the brave and dedicated actions of former New York lawyer, now Major Charles White Whittlesey (don’t read the biography of Whittlesey until after you’ve seen the film). 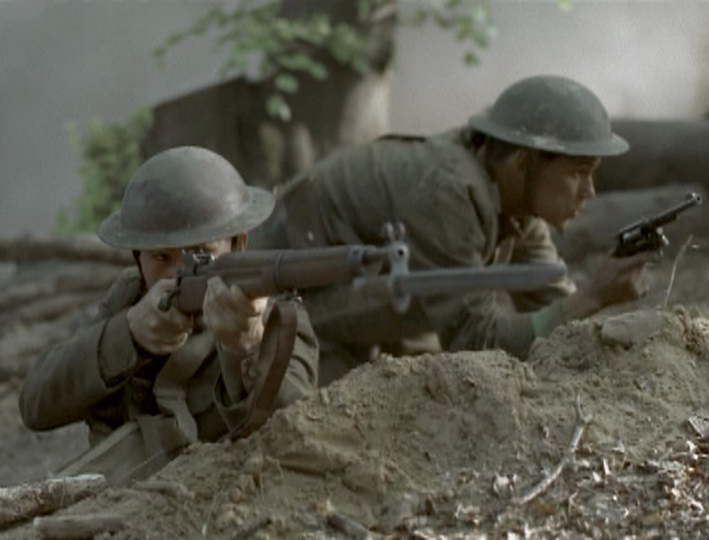 The action takes place in the Great War in 1918, in the Meuse-Argonne Sector in France. 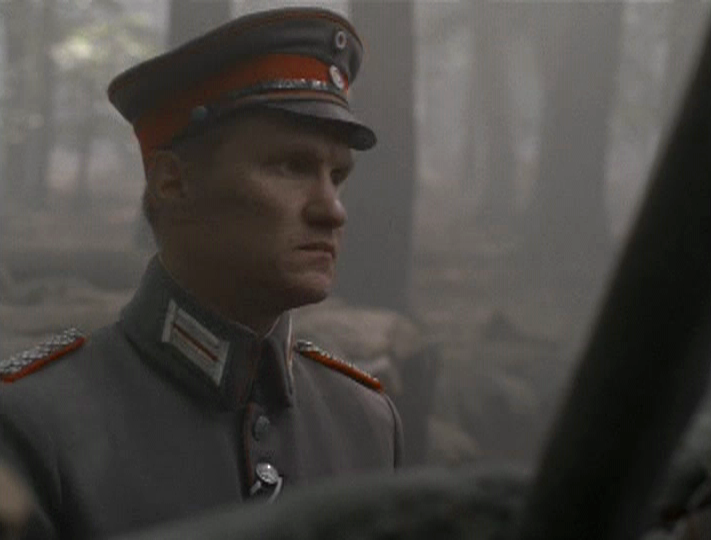 Major Whittlesey, brilliantly played by Rick Schroeder, is assigned what amounts to a suicide mission by General Robert Alexander (Michael Brandon). Though he voices objections and reasonable concern, he is curtly silenced. His sense of duty drives him to lead his men, and to lead well. The film depicts good leadership in the midst of hardship, abandonment and death. I’m not a hyper-patriot, flag-waving, unquestioning “Yoo-Ess-Ay!”-shouting robot, and this film does in fact skirt the line of “American troops are super-humans” nonsense. But I managed to appreciate the movie despite that. The tale stands, as Whittlesey’s men do indeed follow him – not Uncle Sam – into the forests against seemingly impossible odds. As the title implies, they become trapped, surrounded and outnumbered. 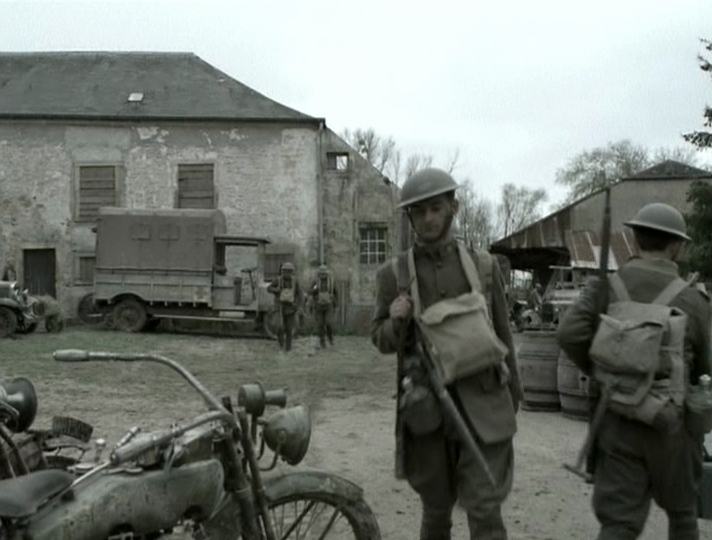 Color grading and uniforms seem to capture the period and the mud well. The film is a tense an suspenseful look at a real case of hardship and bravery and the grueling nature of combat is portrayed well. Viewers gain a real sense of mud-laden, brutal, late-WWI battle. But the story really is a human tale of leadership, overcoming odds and perceptions, and of men devoted to their work. The writer took liberty, according to some historians, by depicting General Alexander as a deliberate liar, sending Whittlesey out with prejudice and false assurances. The character does come across as a typical high-brass, hard-nosed and pompous war hawk, adding tension to the film. It is rather unethical though to portray men’s character in such a poor light when they were not, in fact, that way. You cannot call it “based on real history” when you take such irresponsible liberty. This is a disappointment. Combat scenes are filled with up-close, hand-to-hand action. That point aside, the film does present Whittlesey and his band of New York City kids in a positive and praiseworthy manner. There is a very strong ethnic presence of the soldiers from New York, and that is quite accurate for the day. Immigration between the 1890s and 1930s brought many to America through New York City, and as history shows, men clash when cultures blend. There is a lot of unsavory banter between the Irish, Italian, Jewish, Polish and “appleseeds” in the film. These men, from ethic groups that would otherwise be hostile to one another in the great melting pot of the USA, learn to work together as brothers in arms. Adversity strips away that unsavory and rather immature rivalry that too often mars the relations of one ethic group toward the other. Today we still have silly racial conflict; how little we have progressed! Though there is far too much open-space in the forest, we don’t notice that inaccurate setting until we go to write reviews. Hah! Rick Schroeder, who played a spoiled rich kid in the miserable 1980’s sitcom Silver Spoons, overcame that rather embarrassing role like a master actor should. For one of my generation, who could hardly overcome that childhood image of “Ricky” Schroeder, I was at first disposed to think that this made-for-TV film would be terrible. I was very glad to discover that Schroeder not only excelled at the role, but buried the past completely. Amen and pass the ammo. This is a first-rate acting role. Period weapons seem well chosen, though WWI experts might find nitpicks. The 1911 pistol features prominent as Whittlesey’s chief weapon. The character of Whittlesey impressed me with his leadership. He intentionally kept morale up both by insisting on military decorum and propriety (a rather elementary ‘constant’ that can be laid over any tragic or stressful situation to provide a sense of normal), and by being the first guy over the top in the assaults. He led his men with bravery and won their loyalty. Further, he led his men with good character. I was particularly surprised when Whittlesey was depicted as a man of Scripture. One of the dying men lying in his blood asked the major to read from his Bible. Whittlesey stooped down to pry the book from the young soldier’s hand, yet the pages were so saturated with clotted and thick blood, he could not possibly read. Instead, he cited Psalm 71:1-5, almost word-for-word, in a moving lament for a dying soldier. In this act of devotion to Christ, Whittlesey demonstrates a truly Christian character that is rarely seen in film today. I thought it was refreshing, and know (to my delight) that rank heathen will find it annoying. But it is a reflection of a day when men concerned themselves with the greater good and things that matter much more than mere temporal existence. Twenty or thirty men in German trenches represent the whole German Army in this shot, but we do not notice the slim budget in the midst of the film. 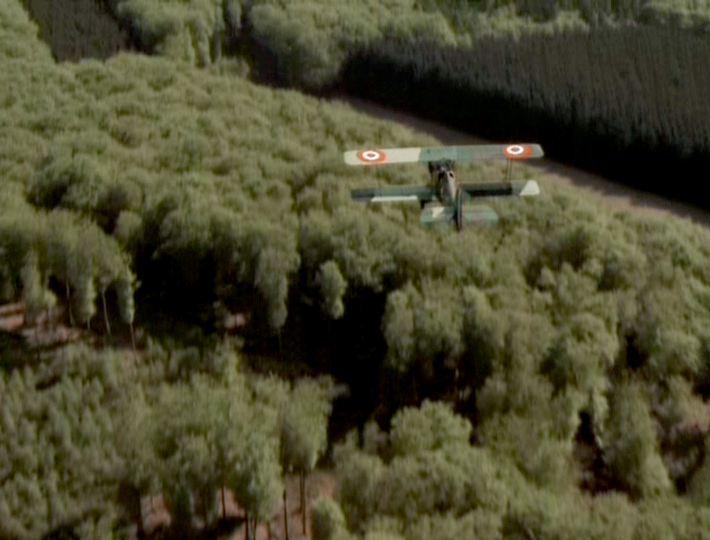 Some have criticized the sets and location as being too clean for a Great War battlefield and the forest too light and sunny. The actual forest is said to be a brooding and dense place, dark and wild, though sadly I have never been there. Still, the overall story is not too terribly tainted, though freedom of movement and long sight-lines certainly did not contribute to the sense of difficulty the men faced. There is no time when you really feel like a whole battalion is really out there lost in the woods, and that is likely due to the TV-production small budget. But the flip-side is that the production value, cinematography and action sequences are very well done. The color grading is appropriately drab and gritty, and the viewer gets to have just enough sense of gore and misery to get the grisly point without going overboard. There are no lingering shots of blood and guts, though there are some shocking blood-and-gut scenes. Schroeder filled some big shoes and did it well. I appreciated the film as a reasonable look at a small scene in the late “Great War.” This global conflict was a colossal and history-shaping event of great loss of life and immense political and worldview hubris. This global and worldview conflict is grossly under-presented in film. We can expect that because of post-modernism’s stupid knack of eschewing and diminishing the lessons of history. I appreciated the film’s attempt to depict the toil of grueling combat, the loss of life, and the misery that takes a great toll on the inner man. We get to see human drama and not just raw names and dates in the troubled face of Whittlesey. The soul of such a man is surely is forever changed. The biography of the historical Major Whittlesey will indeed demonstrate the deep consequences of such internal psychological damage. If you read his bio from a Biblical worldview POV, you see immediately that he needed Jesus. Though this is a story of grit and gumption and the resolute wills of men, we do see the futility of WWI quite clearly. This futility, in the Ecclesiastes sense, is seen in the mass-disregard for the sanctity of life by national and rear-echelon upper leadership. That flippant view of divisions and battalions as mere fodder for the machine, and the nonchalant manner of discussing acceptable losses, is frankly a soul-damaging danger of warfare. Perhaps it is the mental casualties of war that are the worst. The brutality of war is never something people get used to. We see the culturally acceptable form of this outlook in all who embrace the term “human resources.” When people become merely a resource to be expended and utilized, its no wonder they get, well, expended. This film is worth viewing, and while there is a bit of distasteful “American bravado makes Germans look stupid,” the film stands firm as a good story of a good leader.